As the largest Hindu masterpiece temple in Java, the ethereally slender and graceful temple of Prambanan is a magnificent spectacle to behold and an icon of Indonesia’s cultural heritage. The beautiful enchantment of Prambanan Temple stands testimony as the greatest Hindu cultural heritage in Indonesia, seen not only from its incredibly architecture and layout, but also its unique and awesome history and legend. The grandeur, complexity, and integrated architectural concept of Prambanan makes this a truly amazing structure. As a unique cultural and architectural marvel, Prambanan was declared a World Heritage site in 1991 by UNESCO. Java was known by Indian chroniclers before 600 BCE. The name Java comes from the Sanskrit Jawadwip, which means a (dvip) island (yawa) shaped like a barley corn. The Vedic Indians must have charted Java, Yawadvip, thousands of years ago because Yawadvip is mentioned in India's earliest epic, the Ramayana. The Ramayana reveals some knowledge of the eastern regions beyond seas; for instance Sugriva dispatched his men to Yavadvipa, the island of Java, in search of Sita. It speaks of Burma as the land of silver mines. The Agni Purana, along with many other Puranas, calls India proper as Jambudvipa as distinguished from Dvipantara or India of the islands or overseas India. Towards the end of the fifth century, Aryabhatta, the Indian astronomer, wrote that when the sun rose in Ceylon it was midday in Yavakoti (Java) and midnight in the Roman land. In the Surya Siddhanta reference is also made to the Nagari Yavakoti with golden walls and gates. The Indian influence over South-East Asia expanded a lot during the time of Pallavas between the fifth and seventh centuries and the influence was mainly seen in Cambodia. In Indonesia, Srivijaya, a maritime power and dynasty which controlled the empire stretching from Sumatra to Malaya, Thailand, Cambodia and Vietnam arose from obscurity in the 8th century. Srivijaya was an Indianized polity, with its capital near Palembang in South Eastern Sumatra. Rival to the Srivijaya dynasty was the joint kingdoms of Sailendra and Sanjaya based in central Java. It was during their time (after 780 CE) that the temple building activity flourished in the island. These temples were based on the layout and elevation of the Pallavan and Chalukyan temples which were based on Vastu Shastra. What is surprising is the attitude of modern Marxist Indian historians towards the cultural past of Southeast Asia. With their appetite for knowledge Indian historians could have made an impressive study. But on the whole they have remained generally indifferent, not even attempting to integrate their own ancient history with that of their neighbors. The Ramayana and Mahabharata are still are favorite themes for performances in Indonesia not only in Hindu Bali but also in Islamic Java. These epics exert an enormous attraction on a broad layer of society in the Indonesian islands. The architectural remains and sculpture of the Dieng (Di-hyang) plateau, where stone construction is for the first time employed in Java, dates from the 7th or early 8th century. The architectural forms show clear analogies with those of the Gupta, Pallava and early Calukya of the Indian mainland. Architecture and ornament are reserved, and in perfect correlation; and though we could not imagine these monuments in India proper, nevertheless they are more Indian than Javanese. The Dieng plateau represented, not a civil capital, but a place of pilgrimage comparable to the Jaina temple cities of Palitana and Girnar in Western India; permanently inhabited only by priests and temple servants, and for the rest providing only temporary accommodation for pilgrims, amongst other for the king who visited the plateau once a year. The temples are small and mutually independent. Out of a much larger number, only eight are now standing. The leading characteristic of the style is a generally box-like or cubic construction with vertical and horizontal lines strongly emphasized. Each temple consist of a single cell, approached by a porch or vestibule projecting from one face of the outer wall, the tree other wall surfaces being divided by pilasters into three parts occupied by projecting niches or sculptured panels. The roof repeats the form of the main cell; the interior is a plain hollow cube below the hollow pyramid of the roof, whose inner walls approach until the remaining space can be covered by a single stone. A grosteque Kirtimukha crowns the doorway and niches; the makara itself is already developed into floriated ornament and scarcely recognizable. This description applies to the four temples of the Arjuna group, Candi Arjuna, Srikandi, Puntadeva and Sembhadra, and to Candi Ghatotkaca but not of course, to Candi Semar, a small and elegant rectangular building, perhaps originally a treasury, which forms a part of the Arjuna group. The isolated and unique Candi Bhima presents a very different appearance. The lower part of the building is similar to the buildings already described, but the roof is definitely pyramidal in effect, it consists of diminishing horizontal stages, of which the first repeats the form of the basement with pilasters, the other relief, while the angles of the fourth and sixth stages are occupied by three quarter ribbed amalakas. In all probability a complete amalaka crowned the summit. Thus the roof structure corresponds exactly with that of a typical Indo-Aryan sikhara, such as that of Parasuramesvara at Bhuvanesvara, the more developed form of the latter differing only in that the stages are more numerous and more closely compressed. These chandi (temples) have been given name based on the heroes of Pandawas of the Mahabharata, such as Bima, Arjuna, Puntadeva and Gatutkaca and Sri Khandi and Subhadra. (© 2011 image source: webmaster's own collection of photos taken during a recent visit). Dieng Plateau, is a marshy plateau that forms the floor of a caldera complex on the Dieng active volcano complex, and is located near Wonosobo, Central Java, Indonesia. It is the site for eight small Hindu temples from the 7th and 8th centuries, the oldest Hindu temples in Central Java, and the first known standing stone structures in Java. Arjuna temple with Shiva Linga inside the garbagraha. Candi Semar in the front of it. Lord Brahma and Lord Vishnu on outer walls of the Srikandi Temple. They are originally thought to have numbered 400 but only 8 remain. 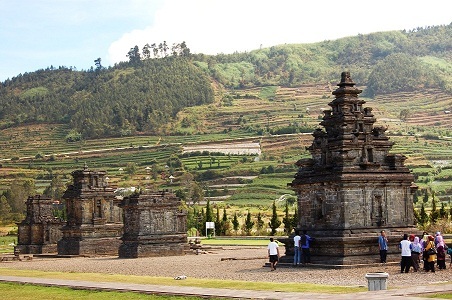 The lofty plateau of Dieng (2093m above sea level) is home to the oldest Hindu temples in Java. Its name comes from Di-Hyang (Abode of the Gods), and it’s thought that this was once the site of a flourishing temple-city of priests. More than 400 temples, most of which were built between the 8th and 9th centuries, covered the highland plain, but with the mysterious depopulation of Central Java, this site, like Borobudur, was abandoned and forgotten. It was not until 1856 that the archaeologist Van Kinsbergen drained the flooded valley around the temples and catalogued the ruins. It is situated on the border of Wonosobo regency and Banjanegara. Dieng temples are beautiful a view, also looking at the history witness the ancient Hindu civilization, glance when seen through the lens of the temple lay the usual course, such as temples scattered generally in Java, there are piles of rocks neatly arranged to form an artistic temple, especially supported by the natural beauty around and the cold, making temples in Dieng was beautiful and fascinating. Makara details on the side of the temple wall. The name "Dieng" comes from Di Hyang which means "Abode of the Gods". Its misty location almost 2000 m above sea level, and its mists, poisonous effusions and sulphur-coloured lakes make it a particularly auspicious place for religious tribute. The temples are small shrines built as monuments dedicated to Lord Shiva. These chandi (temples) have been given name based on the heroes of Pandawa family of the Mahabharata, such as Bima, Arjuna and Gatutkaca. Beside the temples, Dieng Plateau has several sulphur craters and a lake named Telaga Warna (colored lake). Goa Semar cave - for meditation. Bhima temple and details on the front facade of temple. Ganesha statues at the Kailasa Museum in Dieng Plateau. Candi Sambisari was built in the first half of the 9th century, it was a Sivaitic sanctuary. The central temple still contains a Shiva Linga. The external walls are decorated with images of Durga, Ganesha and Agastya. Candi Sambisari was built in the first half of the 9th century, it was a Sivaitic sanctuary. A Shiva Linga on a superb plinth in the interior of the temple - expresses the creative force of God. Lord Ganesha in a niche on the outer walls of the temple. Devi Durga and Sage Agastya in standing pose on the outer wall of temple. Candi Sambisari was unearthed only in 1966 and is now completely reconstructed. It was covered by volcanic ashes which preserved it for 11 centuries and now lies in a 4 meter deep pit. The temple was buried about five metres underground. Parts of the original temple have been excavated. The temple was accidentally discovered in July 1966 by a farmer when working on land that belongs to Karyowinangun. His hoe hit the carved stone which was a part of the buried temple ruins. The news of discovery reached the Archaeology office in Prambanan and the area was secured. The excavation and reconstruction works was completed in March 1987. The temple is thought to have been buried by an eruption of volcanic ash from the nearby Mount Merapi. The discovery of Sambisari temple probably was the most exciting archaeological findings in Yogyakarta in recent years, leading to speculation about whether there are other ancient temples still underground in the vicinity, buried under Mount Merapi volcanic ash. Based on the architecture style and ornaments of the building that resembles those on Prambanan, the findings of Hindu statues around the temple walls, and the lingga-yoni inside the main temple; historians concluded that Sambisari was a Shivaite Hindu temple built around first or second decade of 9th century (circa 812-838). This conclusion was supported by the findings of gold plate in vicinity engraved with letters that according to paleography was used in early 9th century ancient Java. According to Wanua Tengah inscription III dated 908 that contains the name of kings that ruled Mataram Kingdom, the temple was probably built during the reign of Rakai Garung (ruled 828-846). However, historians also consider that the construction of a temple was not always issued by a king. Lesser nobles might have also ordered and funded the construction. The Sambisari complex was surrounded by rectangular wall made from white stone measured 50 meters x 48 meters. In this main yard, there are eight small lingga, four located at the cardinal points and four others in the corners. The Sambisari temple complex consisted of a main temple and a row of three smaller pervara (guardian) temples in front of it. The body of the main temple measures 5 x 5 meters and 2.5 meters high. Around the temple walls are niches contains statues of Hindu gods, adorned with Kala's head on top of it. In northern niche are founds Durga statue, Ganesha statue in eastern niche, and Agastya statue in southern niche. On May 27, 1905, a Chinese steamer was shipwrecked on the beach of Sanur about four miles from Badung. The Balinese looted the wreckage, as they had done for centuries, but the Dutch Government claimed an indemnity of 75 hundred florins from the Rajah of Badung. He considered such a request an insult and refused to pay. This was the excuse the Dutch were waiting for, and in 2906 they sent an expeditionary force into South Bali. Surrounded on all sides by Dutch troops, the defenders, seeing that their cause was lost, decided to die honorably rather than surrender. In September 1906, the Dutch launched one of the most shameful and gruesome episodes in colonial history. During the night of September 20, the Prince set fire to the Palace and the next morning opened the gate. Thousands of Balinese advanced slowly towards the Dutch guns. The men, sparkling with jewels, wore their ceremonial red, black and gold costumes, while the women, carrying their children, wore pure white sarongs, and were also covered with jewels and pearls. On a throne supported by the tallest warriors, the Rajah, a slender young man, sat pale and silent. Suddenly, within fifty yards of the Dutch, the Rajah drew his kris from its scabbard. This was the signal, and the Balinese drew their swords. They shared a curious exaltation at the thought of death. They dedicated themselves, and the sacrifice of their bodies was but the shadow of reality. It was an offering to the gods in the age old struggle between good and evil. The Dutch Captain gave the order to fire and the slaughter began. Balinese Hindu Royalty - Bajra Sandhi Monument. Bajra means a bell used by Balinese priest. This monument is a memorial to the Balinese Struggle. The memorial was opened by Megawati Sukarno Putri in 2003. The Rajah fell and so did hundreds of his followers; wounded women stabbed their babies for fear that they should survive, then husbands killed their wives. The Balinese warriors and children brandishing spears and knives charged the firing canons. Three times the Dutch ceased fire in attempt to stop the slaughter, but the Balinese had decided to die. The Dutch looted jewelry from the corpses and sacked the palace ruins. The Romanus Pontifex, also issued by Pope Nicholas V in 1455, sanctioned the seizure of non-Christian lands, and encouraged the enslavement of non-Christian people. Christian Love? A gruesome massacre of Balinese Hindus by the Dutch Colonists. Apart from a few babies there were no survivors of the massacre. This was the end – the Dutch were now the masters of all Bali. A similar scene was repeated at the smaller court of Pemecutan in Denpasar. If the Dutch had hoped that events would end there, they were mistaken. Puputan – a ritual suicide meaning end of a kingdom. 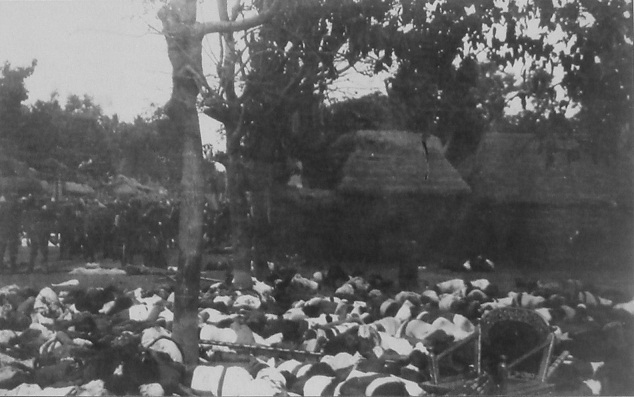 The final act of Bali’s tragedy took place in 1908. The King of Klungkung carrying his ancestral dagger, the kris, slowly emerged from the palace. His court and more than 200 people accompanying him to face the Dutch. The King knelt down and a Dutch bullet killed the king. His wives knelt around his corpse and drove keris blades into their hearts while the others began the rite of Puputan. Klung kung palace was razed. After nearly 600 years, the Balinese courts that had descended from the Royal Majapahit Empire of Java were gone. Hindu Bali was now completely under the control of the Dutch Colonists. Today, the Square in Den Pasar, the former Badung, where it took place, has become a football ground. Vedic India had honorable rules in Warfare. "The Hindu laws of war are very chivalrous and humane, and prohibit the slaying of the unarmed, of women, of the old, and of the conquered." European Imperialism was a disgraceful and cruel chapter in Human History where Despicable Greed and Arrogance and lack of respect for ancient civilization were the principal factors in absence of rules in warfare. 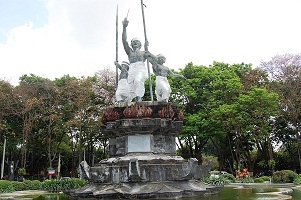 The Puputan square in Denpasar commemorates the last battle between the King of Badung and the Dutch army in 1906. The heroic sacrifice of 2000 Balinese Hindus that were killed by their own daggers or by the Dutch bullets. In 1920 and in 1924, more permits were given to Catholic and Protestant Missionaries to carry on their work in Bali. After 350 years of Imperialism, in 1945, a republic was proclaimed and the whole archipelago took the name of Indonesia – Islands of India. (source: Lovers in Paradise - By Barbara Cartland and Insight Guides: Java and Insight Guides: Bali and Lombok). Until the end of the 15th century, Hinduism was the predominant religion in the islands of Java and Sumatra. Hinduism is said to have spread to these islands as early as the first century AD. The Tarumanagara inscriptions of the 4th century AD are the earliest evidence of Hindu influence in Java. Hinduism flourished in these Indonesian islands until the arrival of Islam in the 14th century. Indonesia is today the most populous Muslim-majority nation, with 86.1% Muslims (2000 census) and 3% Hindus. However, there is a self-conscious Hindu revival movement emerging from the Javanese society with constant reference to the famous Javanese prophecies of Sabdapalon and Jayabhaya. It is interesting to note that the ancient Indian Sanskrit epic, Ramayana, makes a mention of these islands. After the abduction of Sita from the Panchavati forest, Rama and Lakshmana go in search of her. They meet Vali and Sugreeva. Hanuman and Sugreeva near the vicinity of the mountain Rishyamukha. Rama helps Sugreeva by killing his elder brother Vali and making him the king of Kishkinda. In return of Rama’s help, Sugreeva and the Vanaras agree to find Sita. Sugreeva orders Niila, his commander to assemble the troops. He orders Vinata, a mighty vanara warrior to search the Eastern side for Sita. While doing so he describes the islands of South East Asia. Ramayana scenes at the Klung kung palace in Kamasan style of painting. The islands of Yava mentioned in the above verses are said to be the modern day Java islands. The Golden and Silver islands refer to Sumatra which was earlier known as Swarnadwīpa (Island of Gold). The seven kingdoms may refer to the Indonesian archipelago. This clearly indicates the knowledge of geography of regions beyond the Bharata khand by the ancient Hindus. This also suggests that people of ancient Bharat have travelled to these lands and back. People in Java believed that Rishi Agastya came from India and settled here. Usually called Bharata Guru, Agastya is an extremely popular legendary figure in Indonesia, and he was widely worshipped and venerated; numerous reproductions of his image in art and sculpture are found in the country. “In the Javanese images of Shiva, Vishnu and Brahma mudras, the asanas, the lotus seat and the scroll ornamentation on the aureole at the back are derived from the vocabulary of Indian sculpture. In the whole repertoire of sculptural forms in Java there is hardly any motive or element which is not derived from Indian sources. The so-called Kala Makara ornament of Javanese invention is the descendant of old Indian Kirti Mukha which can be traced as far back as fourth century. The makara torana is similarly borrowed from India. The temple watchers or door keepers of Java are likewise derived from the various types of dvarpalas of South Indian temples and the rakshasa types clearly descended from the gana figures which frequently occur in early Hindu temples." Before the arrival of Hinduism in the early first century AD, the native people of Indonesian Archipelago are said to have been practicing an indigenous belief system common to Austronesian people. The indigenous spiritual concepts were fused with Hinduism which evolved into Javanese Hinduism. Many of the ancient Indonesian kingdoms followed Hinduism. The most famous are the Mataram, Kediri and Singhasari kingdoms. The archipelagic empire of Majapahit which ruled between 1293 and 1500 was the most powerful last major empire in Indonesian history. The spread of Hinduism to Indonesia in the first century, with its accompanying artistic traditions meant that it was India that stood at the center and this process continued until the mid 15th century when Intrusive Islamic influence gained an upper hand. Hindus and Buddhist had to retreat to Bali. In the 15th century Indonesians abandoned Hinduism for Islam. It abandoned the boundless richness of the Hindu faith, its universal appeal, its tolerance, the profundity of Hindu philosophy and her lavish Epics and settled for the Islamic Discontent of Monotheism. King Brawijaya V of the Majapahit Empire is said to have converted to Islam in 1478 thus ending the Hindu empire. He is said to have been cursed by his priest Sabdapalon for converting to Islam. Sabdapalon promised to come back after 500 years, at the time of political corruption and natural disaster to bring back the Javanese Hinduism. The first modern Hindu temples are said to have been completed on these islands during 1978 (Pura Agung Blambangan temple). Mass conversions, back to Hinduism, have also said to have occurred in the region during this time and the eruption of Mt. Semeru, around this time, are taken as signs of the prophecy of Sabdapalon being completed. When Japan occupied Java and the surrounding islands during the Second World War in 1942, the Indonesians are said to have come out in the streets dancing, welcoming the Japanese as a sign of the Jayabhaya prophecy. Later, when Japan granted independence to Indonesia in 1945, most of the Javanese believed the Jayabhaya prophecy had been realized. 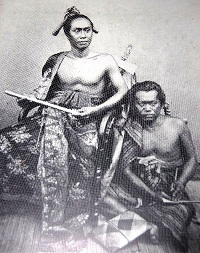 Many Javanese appear to have retained aspects of their indigenous and Hindu traditions through the centuries of Islamic influence, under the banner of ‘Javanist religion’ or a non-orthodox ‘Javanese Islam’. The emergence of a self-conscious Hindu revival movement these days within Javanese community is a sign of significant development. Hindu symbols are still in use in Indonesia. The state intelligence agency of Republic of Indonesia has a Garuda as their symbol and the official airline of Indonesia is called Garuda Indonesia. Today, Indonesia is the largest Muslim country in the world, yet Indonesian culture is perhaps the only one which Islam has not penetrated beyond the surface. In Malaya , too the culture has few Islamic features but the Malays at least have Muslim names, while most Indonesians have retained their original Indian names. Islam is not a culture in the true sense of the term, but it has certain recognizable features, acquired from the Arab and Persian cultures, which it has always sought to impose on its adherents. The French travaller, Jules Lechercq, (1894 - 1966) having seen hajis (Muslims returned from Mecca) joining in the worship of ancient Hindu images, remarked that the advent of the Muslim faith has not alienated the Javanese from their old beliefs. While Islam made religious converts, it could not impose a new culture, for Indonesian culture was far too developed and distinctive itself at the time. For example, Islamic fasts in Indonesia are still called Purwasi upavasa, a term of Sanskrit origin; a Muslim teacher is called guru; and Muslim sultan bear titles such as Maharaja, Srinara and Mandulika. President Sukarno stands for Su Karna (one of heroes of Mahabharata). Note to Ponder: After experiencing the intrinsic superiority of the Indian religion with a glorious and colorful spiritual tradition and powerful prosperous kingdoms, it is puzzling to ponder that the Javanese people turned to a dry, intrusive and unimaginative faith from the Arabian peninsula. (source: Why Indians Should Reject St. Thomas And Christianity – Koenraad Elst). Golden Age prophesized by Hindu king--when "iron wagons drive without horses and ships sail through the sky "- catalyzes religious movements. Islam came late to Indonesia, and its dominance was never complete. Hinduism survived in full form quite well in Bali and a few other areas. In some regions where Islam had only a moderate impact, a considerable proportion of the population are only nominal Muslims. For several reasons, including the country's complex political dynamics, there has been, in recent decades, an increasing trend of these nominal Muslims to return to Hinduism. Java is a center of Islam within the Indonesian archipelago, which, in turn, is home to the world's most populous Muslim nation. Eighty-eight percent of Indonesia's 235 million people are Muslims, and just two percent are Hindus. But the many ancient monuments scattered across its landscape remind one of a very different Java, one where Hindu kingdoms flourished for more than a millennium. At the peak of its power in the 15th century, the influence of Majapahit, the last and largest among Hindu Javanese empires, reached far across the Indonesian archipelago. Islamic influence first advanced along trade networks, gaining a foothold along the northern coast of Java with the rise of early sultanates. Hinduism lost its status as the dominant state religion in Java at the beginning of the 16th century, as these new Islamic polities expanded and the Hindu empire Majapahit collapsed. maar naam, tomaar naam, Vietnam, Vietnam. After years of sloganeering, India is finally getting a chance to put its mortar where its mouth was. New Delhi will help conserve a portion of My Son sanctuary, a world heritage site in Vietnam that has one of the largest collections of Hindu temples and monuments, the oldest dating back to the 4th century AD, outside the subcontinent. The Archaeological Survey of India (ASI) will be restoring the damage done by a weeklong US carpet-bombing during the Vietnam War, when the slogan “Amaar naam, tomaar naam (my name, your name)” was coined in Bengal to show solidarity with the Vietnamese. Bengal politicians’ other “war effort” had been to try and embarrass the Americans by renaming Calcutta’s Harrington Street, where the US consulate is located, as Ho Chi Minh Sarani after the Vietnamese war leader. The Kingdom of Champa in Vietnam, which flourished from the second to the 15th centuries, was strongly influenced by Hinduism. Hindu temples were constructed, Sanskrit was used as a sacred language, Indian art was idolized and Hindu Deities, especially Siva, were worshiped. In fact, Lord Siva was regarded as the founder and protector of the Champa dynasties. 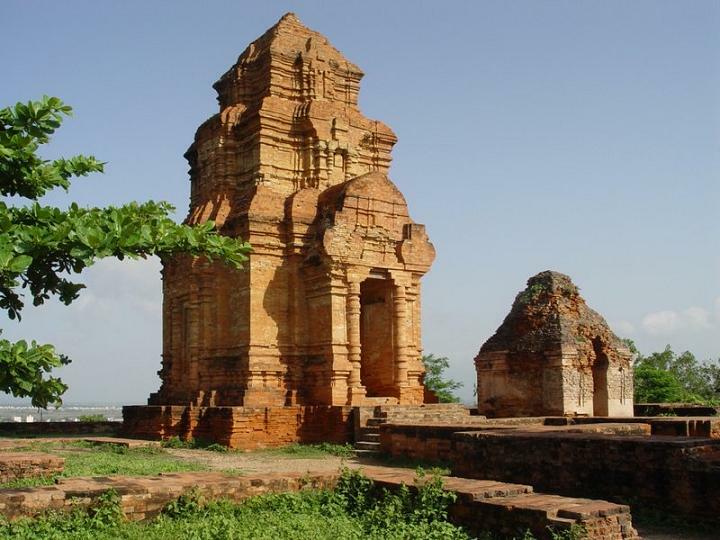 Ancient Monuments: US carpet-bombing during the Vietnam War did significant damage to the Temple. (image source: Hindu-Buddhist Art of Vietnam: Treasures from Champa - By Emmanuel Guillon). For more refer to chapter on Greater India: Suvarnabhumi and Sacred Angkor and Seafaring in Ancient India. Four decades have since passed but My Son’s 70-odd monuments still wear their war wounds from the B52 bomber raids of August 1969. The surrounding area is considered dangerous even now because of undetected landmines, another legacy of the war. “A team of ASI officials has visited the site and is finalising the preliminary report,” said ASI additional director-general B.R. Mani. One reason the sanctuary was awarded world heritage status was that Unesco recognised it as an exceptional example of cultural interchange. It is the place where subcontinental Hindu architecture was introduced into Southeast Asia over 1,600 years ago and evolved for over 10 centuries. For several years now, teams from Italy and France have been working on the site, dotted with red-brick shrines and other structures, mainly built in the Indian architectural style of Shikhara (tapering towers). The restoration is expected to be a part of next week’s scheduled bilateral talks with the Vietnamese President in India. The temples at the sanctuary, set in a valley surrounded by high mountains, were built by the Cham rulers, who established the Champa kingdom towards the end of the 2nd century AD and soon came under the influence of Hinduism. Most of the shrines are Shiva temples though some are dedicated to other deities. The earliest is dedicated to Bhadresvara (Shiva), a name that derives from that of the Cham king Bhadravarman. “The peak construction time was between the 8th and 10th centuries, when some of the most magnificent monuments came up here,” the ASI official said. For conservationists, the challenge is that much of the construction technique of the Cham dynasty’s workers is still a mystery. Even the decorative carvings on the temples were cut directly onto the bricks themselves, rather than onto sandstone slabs inserted into the brick walls. From AD 1190 to 1220, the Champa kingdom was occupied by the Khmers. From the 13th century, it slowly declined and was absorbed by the growing power of Dai Viet. It ceased to exist as a kingdom in the later 15th century, when worship ceased at My Son. The site was rediscovered and introduced to the modern world in 1898 by a French scholar, M.C. Paris. (source: ASI to help restore Hindu temples damaged in US bombing - telegraphindia.com ).